Petergate, now part of the Minster Quarter, stands on the site of the Roman Via Principalis, the first century main east-west route through the Roman fortress. The street is no named due its proximity with York Minster, which is dedicated to St Peter. Petergate runs from medieval Bootham Bar the Roman Prima Porta Dextra or right gate, to Kings Square, known to the Romans as Porta Sinistra, the left gate. One of the four main entrances through York's historic city walls, in common with Micklegate Bar, Bootham Bar was used to display the decapitated heads of traitors, including that of Thomas Mowbray, Earl of Norfolk and Earl Marshal, who led a failed rebellion against Henry IV in 1405. The heads of three rebels who opposed the restoration of Charles II after the Commonwealth period were placed there in 1663. 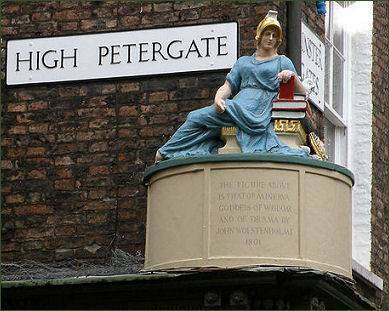 High Petergate runs from Bootham Bar to Stonegate, was the medieval route into York from the North. Some of the medieval buildings still stand here, forming an eclectic mix with those dating from the Georgian era other period styles of architecture. This street contains restaurants, pubs, tea rooms hotels and a wealth of interesting shops. During the summer months street artists work on the pavement beside the Minster. One of the streets most impressive structures is the Georgian mansion at 62 Low Petergate. 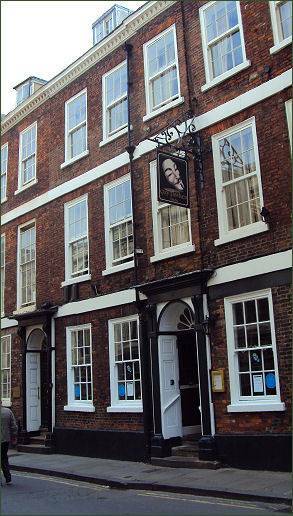 It was once home to Dr Alexander Hunter, the founding physician of the York's lunatic asylum. In Dr Hunter's time at the Lunatic Asylum controversy arose concerning both the treatment of the patients and the financial management of the hospital. From the late nineteenth century the building was used as the York College for Girls. Petergate House, a Grade II listed building by Bootham Bar was once the home of Sir Thomas Herbert (1606-1682), a historian and groom of the bedchamber to Charles I, while the king was in the custody of Parliament. Sir Thomas who stayed with the king on the night prior to his execution 30 January 1649 but was too distraught to accompany him to the scaffold. In 1678 he published Threnodia Carolina, an account of the last two years of the king's life. The Hole in the Wall pub, which is likely to be a reference to Bootham Bar, was once known as 'The Board Inn' and is reputed to be haunted by the mysterious footsteps. Excavations of the Board Inn carried out in 1816 revealed a dark secret. A hole was discovered which lead to a dungeon, where chains and manacles hung. A tunnel was also found which was bricked up. Just before the entrance to the pub is the entrance into Little Peculiar Lane, the shortest of all York's snickelways and the most attractive due to its view of the Minster. The church of St Michael le Belfrey(pictured above right) is the only remaining sixteenth century church in York, constructed between 1525 and 1536 it is the largest pre-Reformation parish church in the city. It occupies the southern side of Minster Yard adjacent to where High and Low Petergate meet. The church probably derives its name from the Minster's belfry which once stood on the site. The beautiful stained glass east window dates to the mid fourteenth century and is likely to have been taken from a previous church on the site. It depicts the martyrdom of St. Thomas Becket. Opposite St Michael le Belfrey Church is the Guy Fawkes Inn, behind it is the cottage where the notorious instigator of the Gunpowder Plot, Guy Fawkes, who attempted to blow up King James I and the Houses of Parliament, is purported to have been born. He was the second of four children born to Edward Fawkes, a proctor and an advocate of the consistory court at York, and his wife, Edith Blake and was certainly born in the locale. 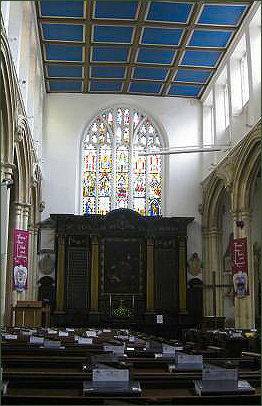 The church registers of St Michael le Belfrey, record that Fawkes was baptised there on 16 April 1570. The York Arms pub occupies the site of Peter's Prison, which was in use as a prison until 1837, convicted criminals were held there after trial at Minster Court. At the junction of Petergate with Stonegate, the Roman goddess Minerva, goddess of wisdom and learning, is portrayed leaning on a pile of books with an owl above a corner shop, marking the former home of a writers' meeting place and one of Britain's earliest bookshops. The inscription below is dated 1801 and attributed to John Wolstenholme. Low Petergate runs on from Stonegate to King's Square, along the way are two more of York's famous snickelways, the quaintly named Mad Alice Lane and Hornpot Lane. Just off the pedestrianised street stands Talbot Court where a wrought iron gate leads to a quaint medieval half-timbered courtyard with hidden gardens overlooking York Minster. During the eighteenth and nineteenth centuries, insurance companies had their own private fire brigades and the plaques on the exterior walls in Petergate mark the properties they covered. 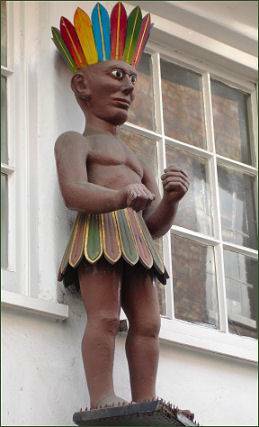 A figure of an American Indian above the door of 76 Low Petergate, puzzles many visitors, it once advertised a tobacconist's shop and the indian's headwear and kilt represent Virginia tobacco leaves.